The edges of the red and white striped table top have an ever so subtle curve which reflects a flag waving in the wind. 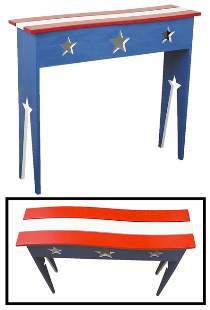 Red, white and blue stars and stripes design is easy to paint. Designed to be built from standard size pine boards. All patterns drawn FULL SIZE. Measures 34H" x 40W" x 11D".